A bug exists in version 1.0 if you have no venues in the database. It will cause the entries in the table to the right of the location column to be shifted right. The simple work around is to add one venue to the Venues Database. This will be corrected in version 1.1 of the plugin. (1) Select Tournament. Select the tournament you wish to update and click Update Table. 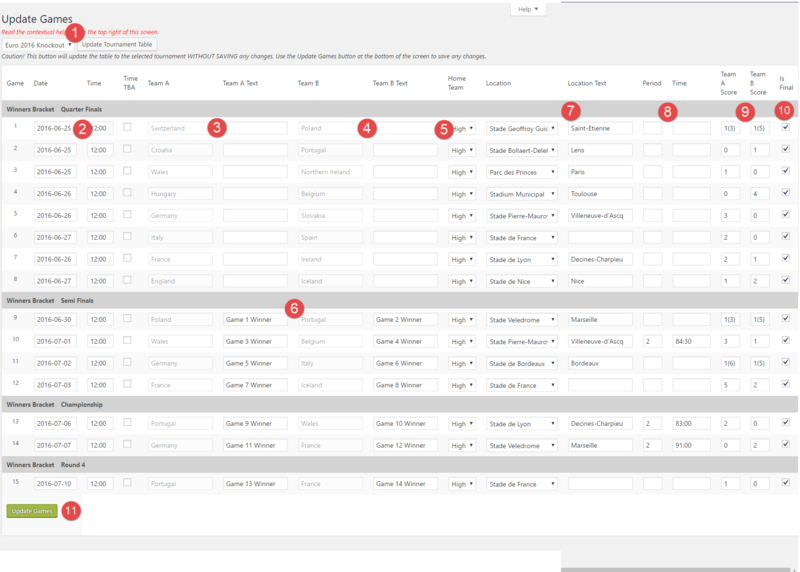 Note that Update Table fetches and displays the existing data for a tournament. It does NOT update the contents of the table (the tournament data) See Update Games below. (2) Game Dates & Times.Set the game dates and times with these fields. Dates and times must be entered for all the games. The Time TBA checkbox displays the time as “TBA” if the time is not known. “TBA can be changed on the Settings Screen. (3,4) Team & Team Text. (1st Round) The first round teams, Team A and Team B, are determined by the Teams/Seeds table on the Edit Tournament screen. If there are no entries in the Team/Seeds table, the teams may be entered in the Team Text fields. See (6) below. (5) Home Team. Team A, Team B, or the highest seed may be selected as the home team. If the highest seed is selected as the home team, the plugin will determine the home team based on the Teams/Seeds table. If the home team is not important, it does not have to be displayed. (6) Team & Team Text. (Later Rounds) After the first round, if the teams are selected in the Teams/Seeds table, teams will be determined by the previous round’s results. If the Teams/Seeds table is not used, the winning teams must be entered in the Team Text fields for every round, after the results are known. (7) Location & Location Text. Locations may be entered from the Venues database, or they may be entered as text. If they are entered as text, they cannot be linked to Google Maps or venue URLs from the database, nor can the format for their display be changed. In either case, the game location must be entered for every game. (8) Period & (Game) Time. Enter the game period and game time (time remaining) for games in progress. These fields are not shown for games that have not started or scores marked as final. (9) Scores. Enter the game scores. Scores such as “2 (5)” or “2-4” may be used to indicate final results based on penalty kicks, or “27 (2OT) to indicate overtime games. (10) Is Final.Check this box to indicate that the scores are final. If teams have been entered in the tournament’s Teams/Seeds table, the winners (and losers) will flow down to future rounds in both the “winners” (and “losers”) brackets. (11) Update Games. Updates the tournament database with the data entered in the table.